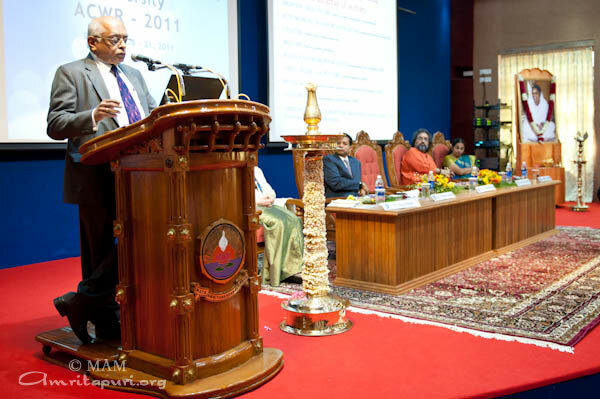 Dr. R. Chidambaram, the Principal Scientific Advisor to the Government of India met with Amma during his visit to Amrita University for the International Conference on Wireless Technologies for Humanitarian Relief (ACWR2011) at Amritapuri on 19 December 2011. 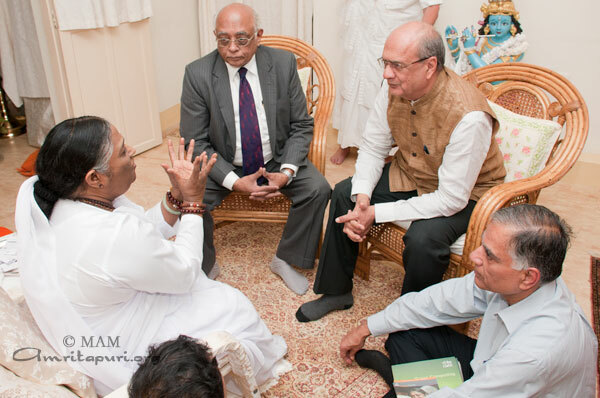 Along with Dr. Chidambaram, his colleague S. Chatterjee and Dr M.H. 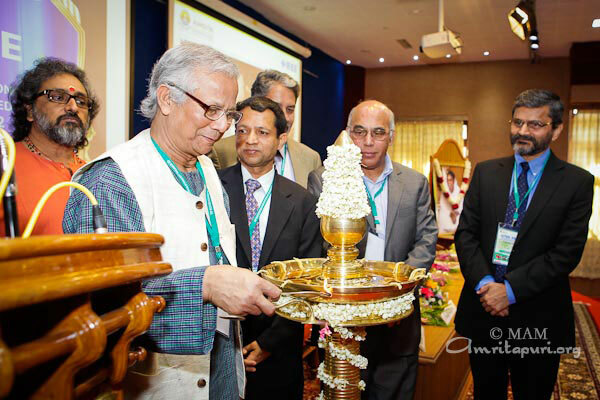 Mehta, Chairman of the National Bioshield Society also participated in the discussion. 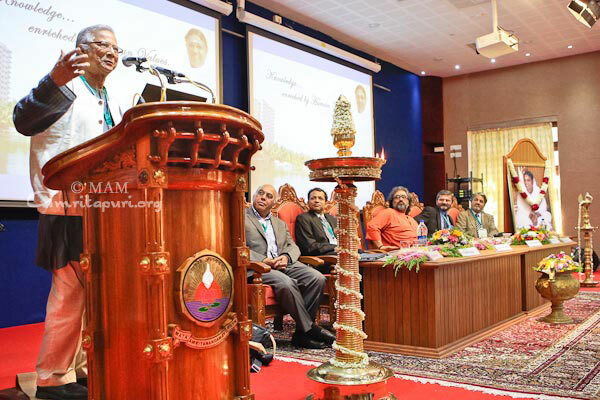 Dr. Chidambaram, who is a renowned nuclear scientist and metallurgist, mentioned to Amma that his focus at the conference was to combine wired and wireless networks. 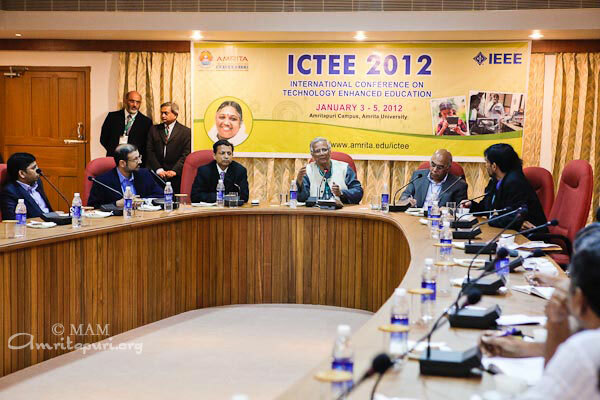 He felt that Amrita University’s haptic technologies project had a lot of potential. Dr. Chidambaram was very much impressed by the landslide detection system developed by Amrita University and requested Amma to bring this technology to the Himalayan region of Uttarkashi where landslides are a regular phenomena. Amrita University had designed, built and deployed a real-time landslide warning system in the hills of Idukki district of Kerala and was even able to issue warnings on time. 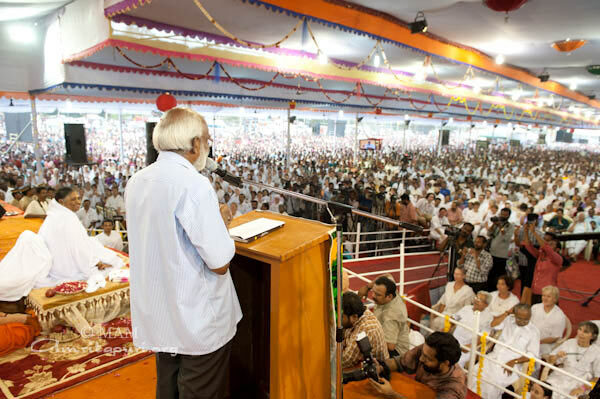 Amma said that this system is designed to work in the Kerala mountains. She started by talking about the necessity of simulations before actual deployment and how mini-models need to be implemented for testing. 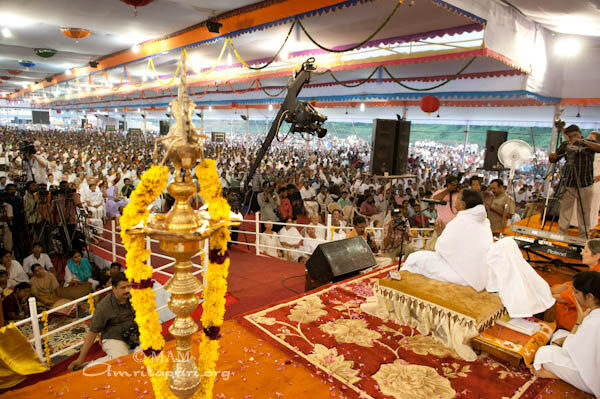 Amma went on to talk about ‘pore pressure’ due to a large quantity of wide-spread rainfall on a hill. She outlined that each hill or mountain may have different types of soil every 10-20 feet and that this variety may yield more questions to study. She said that we need to consider the weather conditions and the soil/mountain quality before deploying in Northern regions. 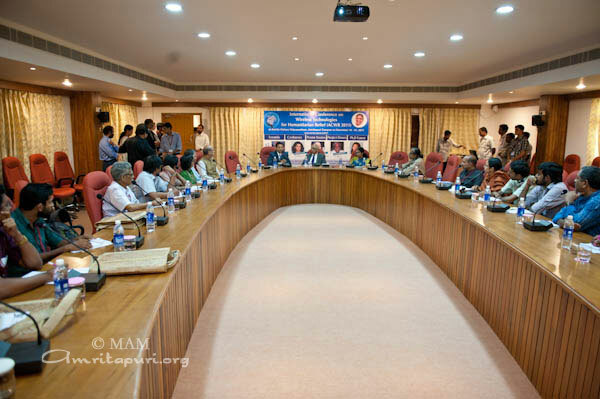 Upon hearing Amma pointing out these scientific matters in such detail, Dr. Chidambaram was indeed surprised. Amma also mentioned that her motivation to pursue research at Amrita University originated from her seeing the suffering around – poverty, starvation, sickness, environmental pollution and contamination. She stated that multinational companies abroad give importance to research, but not so in India. Now the situation is changing. 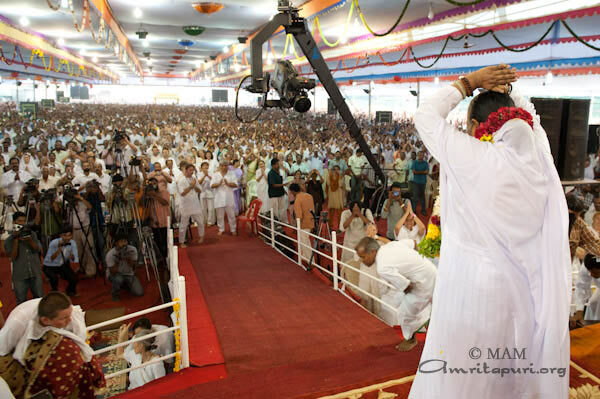 Amma also mentioned that other countries must grow and become happy. Another problem of India is the so-called ‘brain drain’. 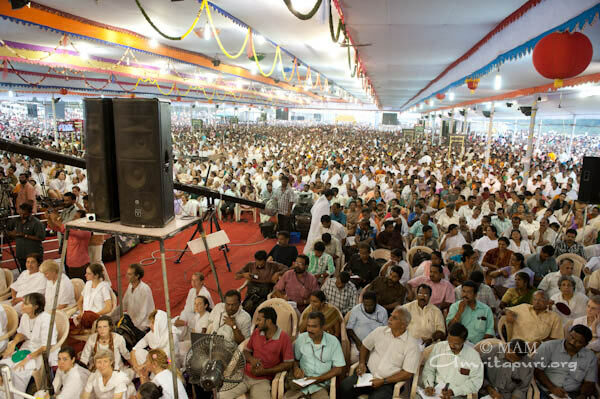 To this, Dr. Chidambaram replied by telling Amma that she had attracted a lot of talented people from abroad, which even the government finds hard to do. 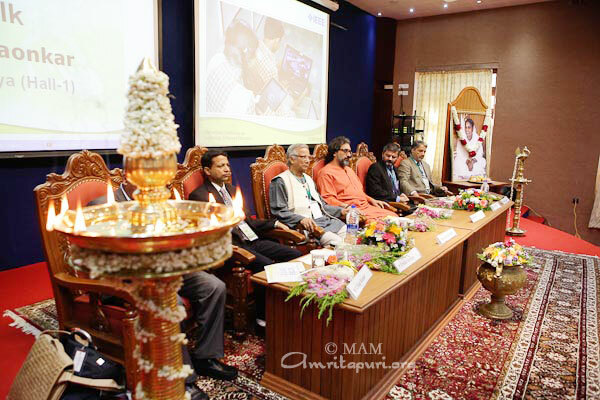 Amma continued saying that the level of respect society shows for scientists should increase. When science is respected the motivation to serve and find cures for cancer and other diseases will automatically arise within, while the desire to make quick money will decrease. Amma said “Nature is God’s form. In creation, nothing is insignificant. Everything is important. Creation and creator are not two, but one. The ocean and its waves are not different but the same. Gold and gold ornaments are the same. Clay and clay pots are of the same essence. That is what science tells us too. 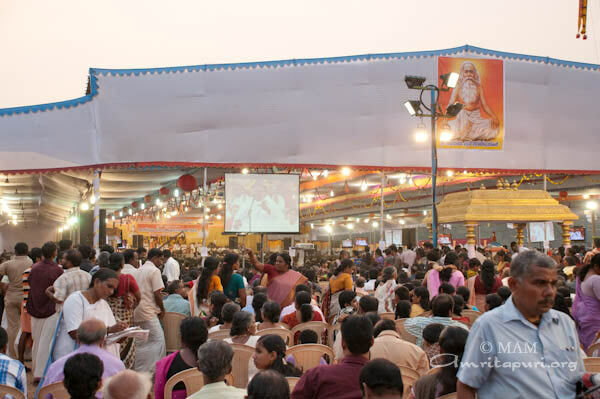 Everything (matter) is energy” Amma talked about seva (selfless service), science and education and how they benefit both the individual and society as a whole. She also mentioned about the need of quality education and the essence of values. 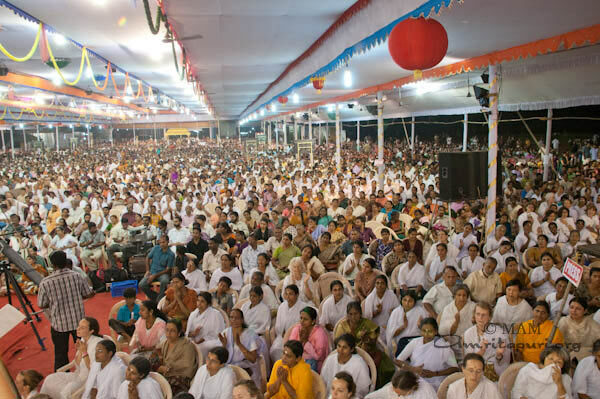 As the meeting was coming to an end, Amma asked how the attendees became interested in spirituality. Dr. Chidambaram talked of how science has its limits. He said that for any scientific law questions like ‘Why that law?’ ‘Will that law stand true in the future?’ still cannot be explained. The laws that connect living and non-living matter and determine the interaction between atoms are still a puzzle. Parabrahmam (Consciousness that pervades all matter) could be the explanation, he added. Science can explain ‘how’ things are happening, but not ‘why’ they are happening. That’s where one turns to spirituality for the answers. 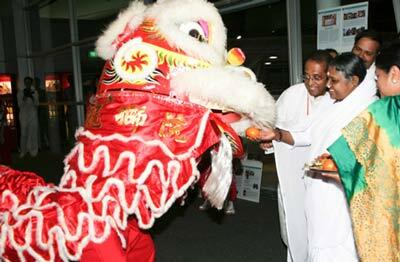 Amma to visit Australia from 12 – 24 April 2012. One should be able to see all of creation as one, the unity beyond the apparent diversity. 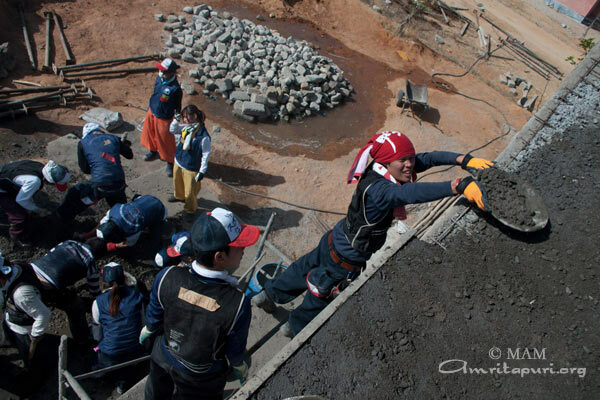 Amma advises us to practice that attitude in our day to day life, and we could get a glimpse of it by seeing the IVUSA Japanese students working on the Amrita kuteeram site of Raichur, Karnataka. For one who is not familiar with Japanese culture, it is really surprising to observe the group-oriented mind, the absence of self-centered attitude and the enthusiasm these students have. Seeing these 78 students (40 girls and 38 boys) acting as one, helping each other, responding all together with the same voice, one is reminded of the different cells of the same organism, and of course, of Amma’s teachings about selflessness and unity beyond diversity. 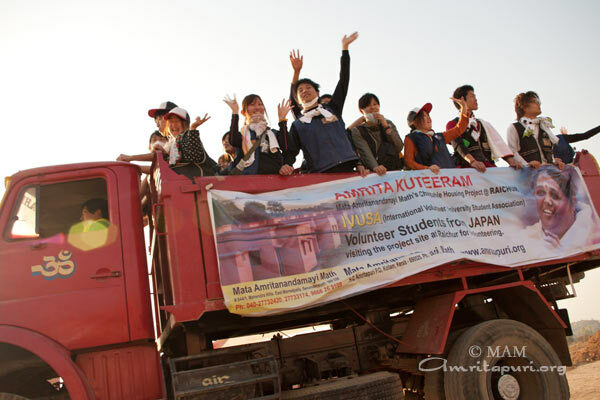 The IVUSA (International Volunteers University Student Association) group came to Raichur from 14 different universities from all over Japan, via Delhi and Hyderabad, arriving on the evening of Shivaratri. 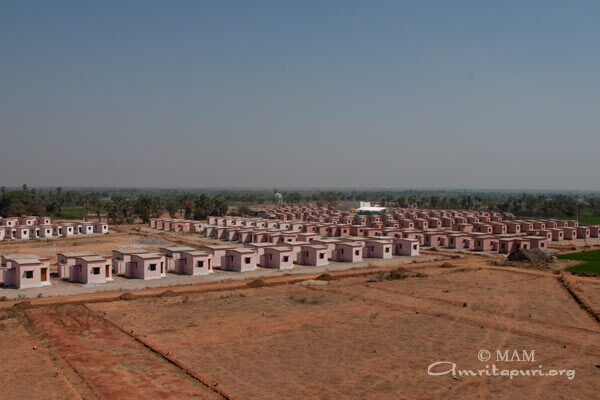 IVUSA has participated in Amma’s charitable activities over the last 14 years, including: the Gujarat earthquake housing project, a slum redevelopment project in Pune, tsunami relief work in Nagapattinam and Cochin, flood relief work in Raichur, etc. The group was given a warm welcome by local villagers with garlands and a drum band. Shortly after arriving they were asked whether they are willing to walk to the Shivaratri program at the local Shiva temple, some 3 KMs away. Despite such a long exhausting trip, all enthusiastically expressed their desire to participate. The next morning, all climbed aboard the truck and tractors for a ride to construction site, which is located 10 kilometres away. The volunteers arrived at the village to wonder struck looks from the villagers and the smiles, giggling and waving from the local children. 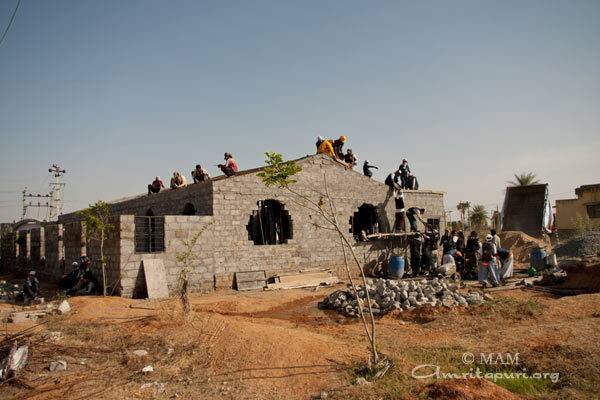 The day was mainly dedicated to the construction of a cement roof for the community hall, at a site with 160 Amrita kuteeram houses. After a day of hard work under the scorching sun of the Karnataka plains, everyone went to the Krishna river and had a cooling and refreshing bath, and were given sugar cane to eat from the villagers. For the remaining few days, the students will focus their efforts on the Dirampur site and will help put the finishing touch on the houses (painting, cleaning, and adding that unique Japanese touch); to get the houses ready to be handed over to the beneficiaries who are now living on an overcrowded and monsoon-flooded island on the Krishna river. 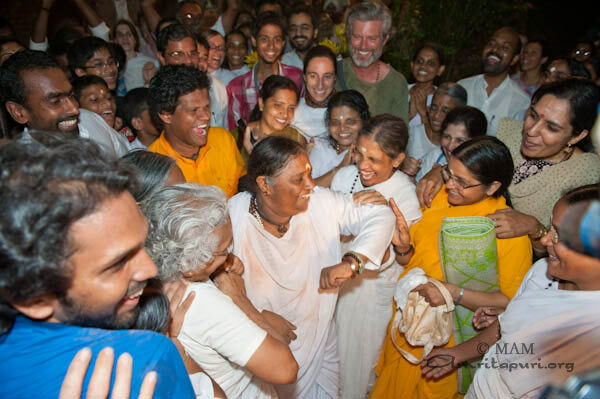 After that, the students will travel to Amritapuri, to experience Amma’s darshan, and then back home, carrying along in their heart life-long memories of their journey in India. I was wrong! “She doesn’t do it anymore,” I had said. 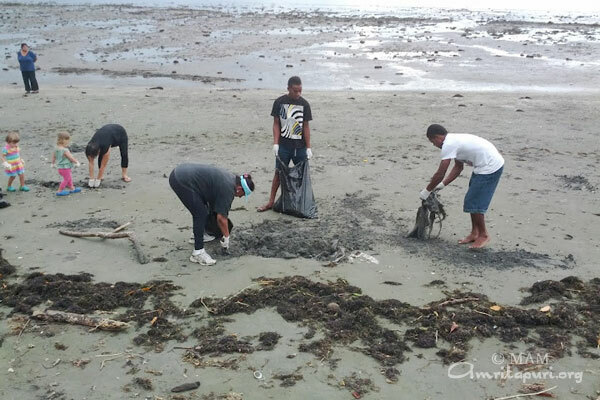 “Amma used to come out at night and help with whatever work there was to be done–carrying bags of sand from the beach to fill in a swampy area, or lifting slabs and chunks of broken concrete to clear a space for new construction, or sorting through garbage that had piled up “out of sight” behind huts (not out of sight of the One Who Sees All, though!). On Friday night, just as dinner was ending, the bell rang three times–what? But Amma has already gone to her room! What’s this? Another archana? (Lots of extra archanas here lately, for the benefit of Nature and World Peace). 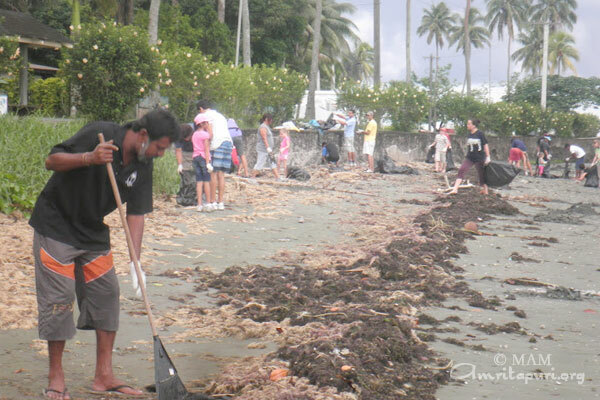 But no—everyone rushing in the direction of the beach, but stopping short of there. 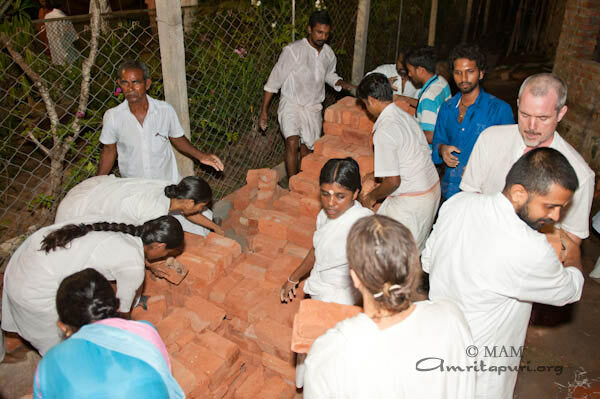 A huge load of bricks had been delivered in the area where new accommodations are being built, and Amma wanted these bricks moved closer to where they were needed. Or was it just that she wanted exercise, for herself, for all of us? For quite some time, Amma has been telling us all that we need to take better care of our bodies. Get some exercise. Do yoga. Don’t just sit! Well, whether the goal was getting the bricks into place, or giving us all some exercise, it was achieved. In about 40 minutes, the mountain of bricks had been moved, carried in stacks from two to maybe six or eight, depending on the strength of the individual ‘porter’. 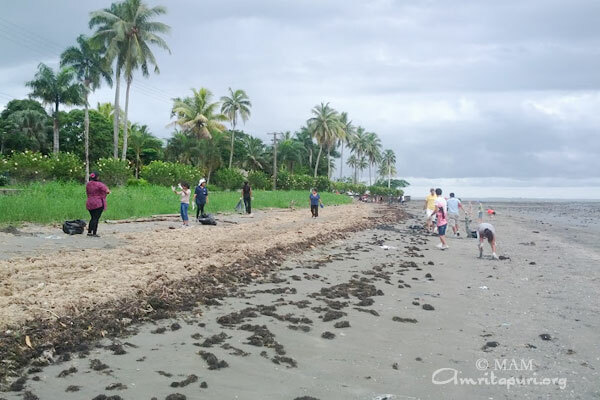 No forklifts, no wheelbarrows–just like the old days: each one doing what she or he could, and there was something to do for anyone who showed up! 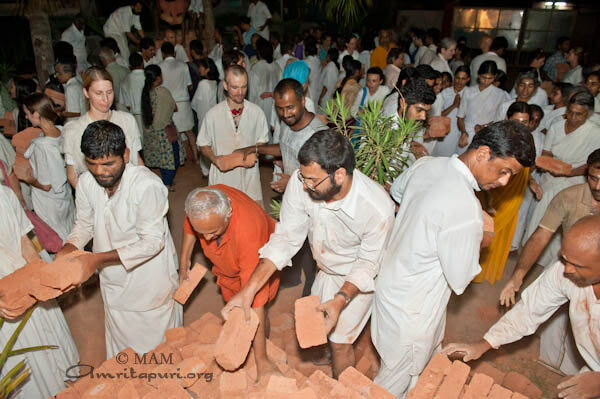 Of course, the most popular thing to do was to watch Amma–whose clasping of bricks to her chest was reminiscent of her holding one of us in her darshan embrace–but she was adamant: “No Looking!” she called out a few times–as if people could resist looking when the all-attractive one was passing by with her load of bricks! The way to get a look was to participate in the work, so hundreds of people were suddenly brick-carriers. 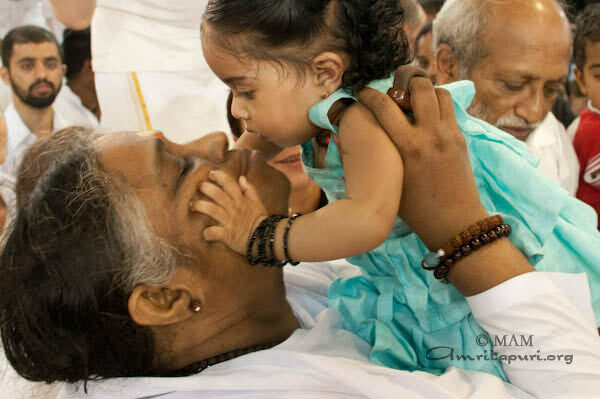 Just like Amma, they would go to the original stack, hold out their arms, someone there would load them to the limit they indicated, and then they’d turn away and carry their loads to the destination, where someone else would accept and stack the delivery. Back and forth she marched, with someone holding a light for her path, someone else calling out “Move, move! Amma’s coming!” For somehow, the various routes from the starting pile to the destinations were clear and easy, one line headed one way, the other another way–but Amma’s route always got crowded with all who couldn’t make themselves obey the “Don’t look!” injunction, and with people who’d just arrived, and didn’t know what was going on, and on suddenly seeing Amma would be startled, and gape. Amma would laugh, enjoying their surprise as much as they did! 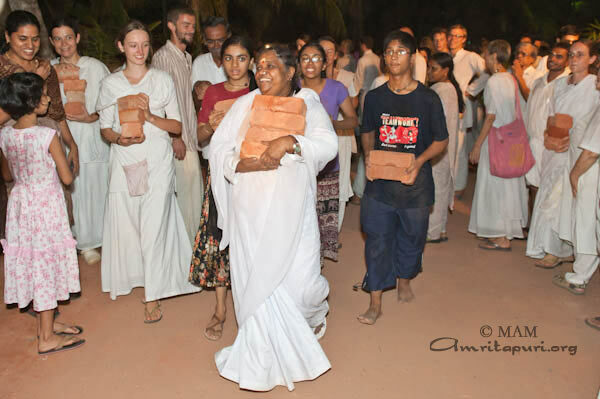 Yes, the bricks needed to be moved, and she wanted exercise, but Amma always does more than one thing at a time: so every few minutes her route would change—not just because the old one had become too cramped with onlookers, but in order to give a gift to those who were working on a different route–suddenly, they who’d stayed away and ‘on task’ found in their midst Amma! 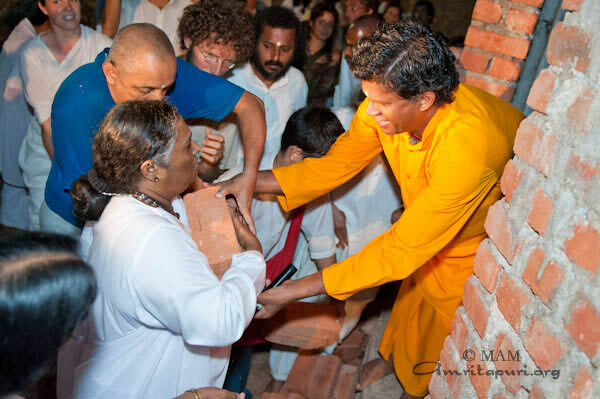 So along with the stated goals of brick-moving and body-moving, there was the other one Amma’s always engaged in: heart-moving. 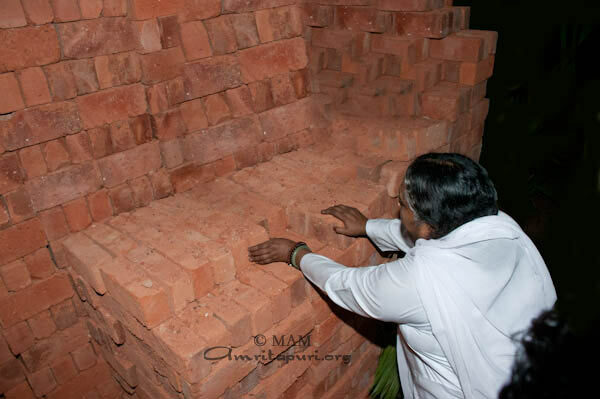 When the job was done and no more bricks remained to be moved, after handing over her last load, Amma kept on walking to her room. Finished? Not at all–still more joy to be offered: she sang a few lines, and danced along, elbows pointed, body moving in time, face bright with playful joy. Up the steps to her room now–she turns, says “Hard to know whether there were more people or more bricks!”, and goes to her room. She comes to her window, and starts pushing bags of treats out the window–banana chips, crisps and more–, letting them fall to the eager hands below, where they are torn open and the contents handed around to all her children. 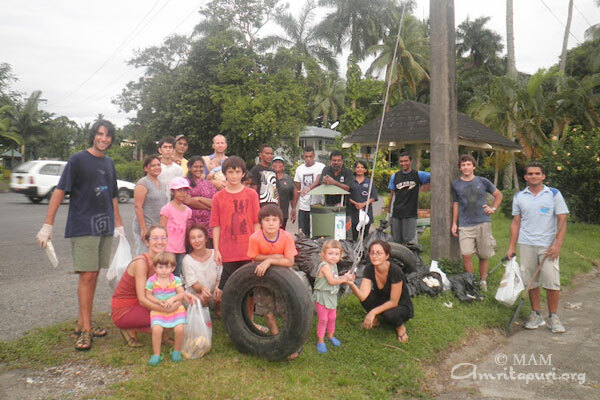 “Children share amongst yourselves!” heard Amma’s voice was heard clearly despite the din. 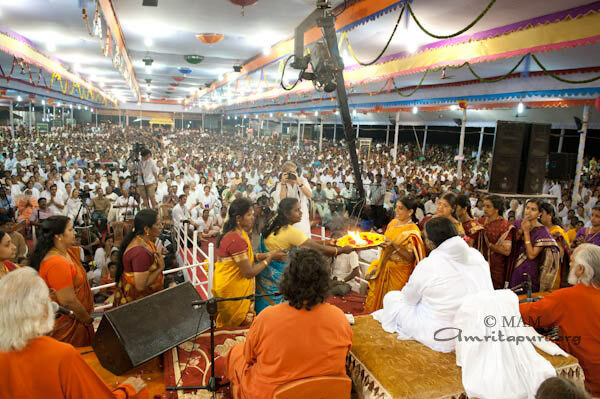 With Amma, enough is never enough; she’s always giving more. 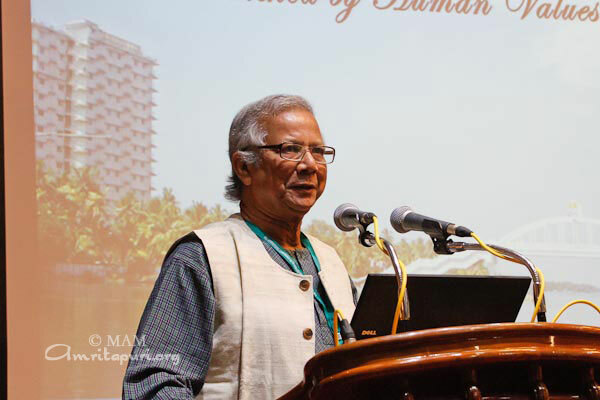 Prof. Muhammad Yunus, 2006 Nobel Peace Prize Laureate and Founder, Grameen Bank – a micro finance and community development bank started in Bangladesh that makes small loans to the impoverished – came to Amrita University’s Amritapuri campus to inaugurate International Conference on Technology Enhanced Education (ICTEE2012). Then he went on explaining how he brought change in the Bangladesh by empowering women combining technology and service. In his inspiring speech he reiterated that the purpose of education is to unleash the creativity of the individual to solve the problems of the people which will also help bring in financial gains. 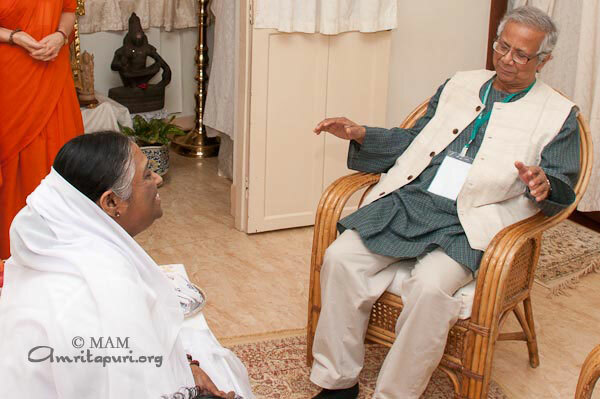 After the function at the University, Muhammad met Amma at the ashram. In the meeting he expressed his willingness to share his wisdom with Amrita University for its research and development programs. 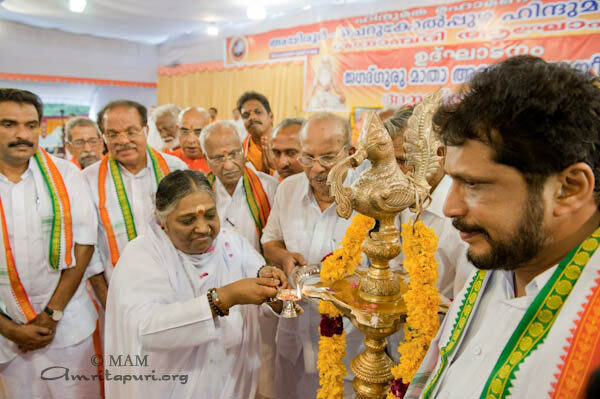 “Today is the auspicious occasion of the 100th anniversary celebrations of the Cherukolpuzha Hindumata Parishat. 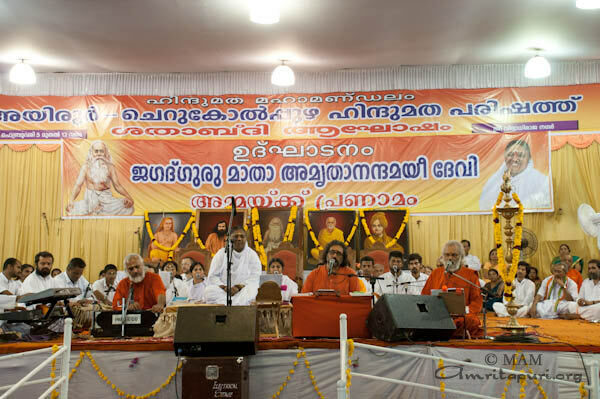 Seeing the ignorance of the common man regarding the principles of Hindu Dharma and the money being extravagantly spent for religious festival celebrations, Mahatma Sri Chattambi Swami’s heart was filled with pain. Understanding that knowledge alone can uplift people, Swami desired to open the doors of knowledge to everyone. 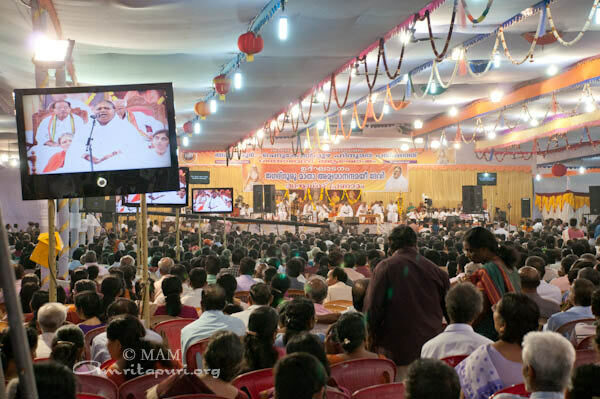 Thus, it was to increase knowledge and unity in the people that Hindu Hindumata Parishat started functioning under Swami’s guidance” said Amma in her address. Since then the meeting has been held annually on the banks of the sacred Pampa river. 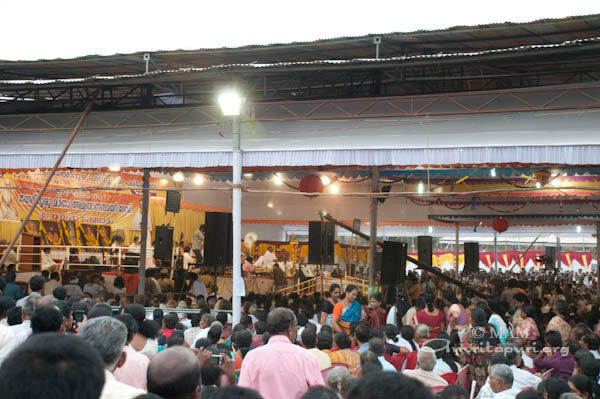 Amma was first invited to the event in the year 2000 for the 88th congregation. 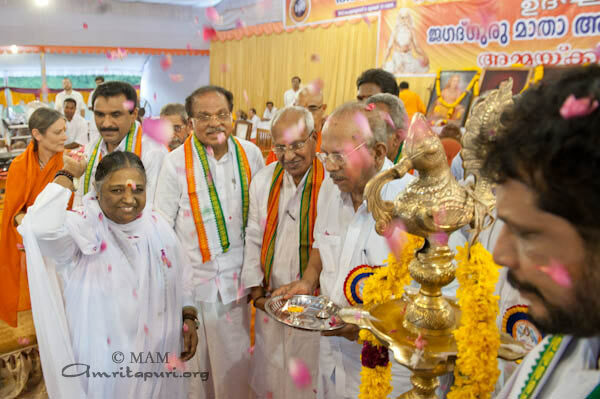 Today, 12 years later, Amma returned for the 2nd time to inaugurate the 100th annual Hindumata Parishat. 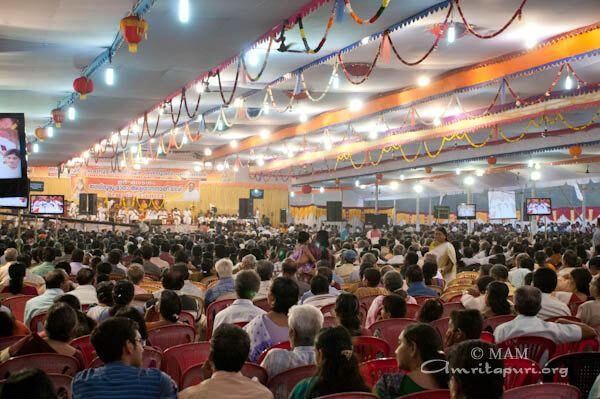 The congregation will last one week, each day will be full of different activities led by various spiritual leaders. 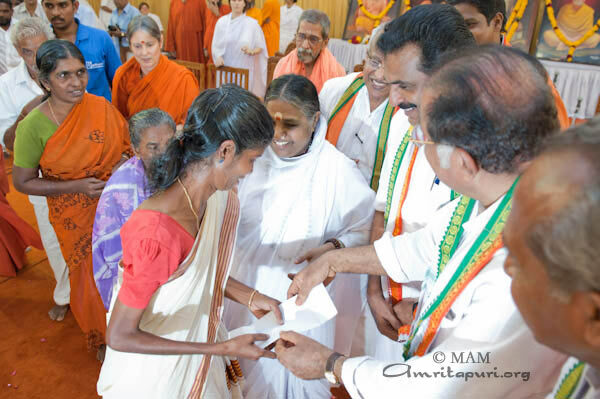 Amma extended the reach of the MAM’s charitable activities by presenting 10 local women with Rs.25,000 of working capital for self employment. 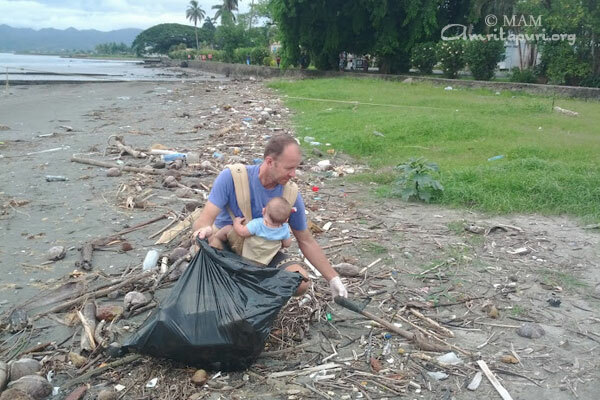 Two days before the event began, two local families were featured on the local TV news, showing their dire financial plight after the fathers of each family lost their means of livelihood. 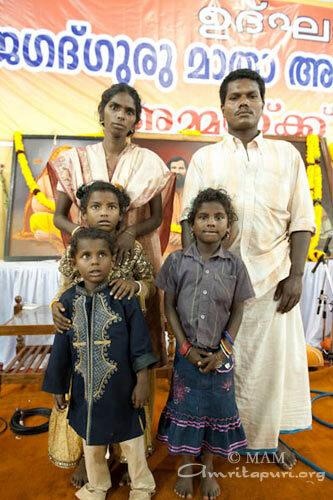 Both families ended up living under a bridge. 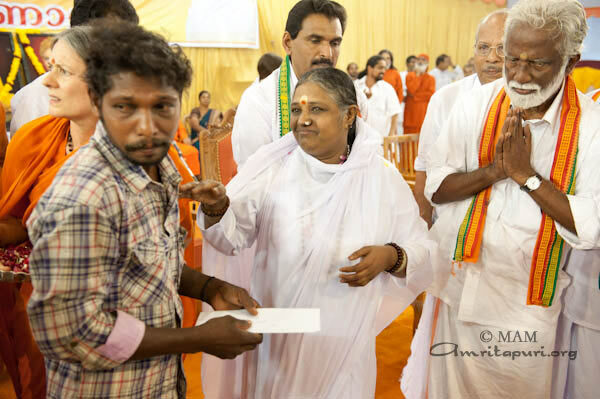 Amma was informed of their struggle and invited them to the program and offered them each plots of land and a promise to build each a new home. 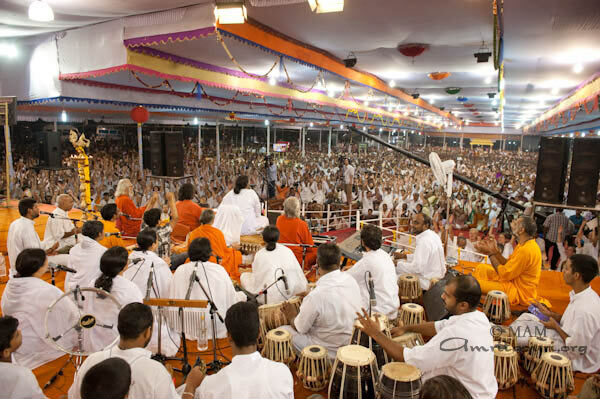 After the charitable functions ended, Amma graced the occasion with her satsang and bhajans. 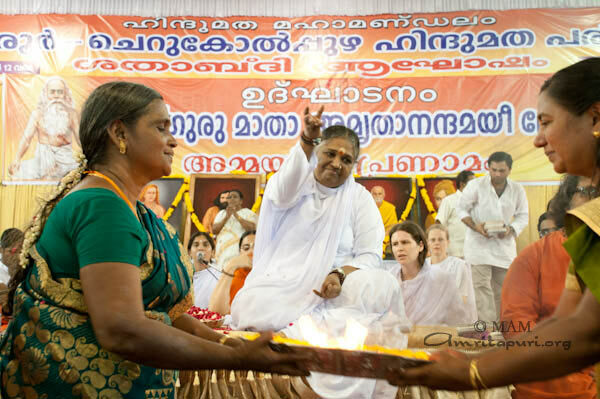 In her satsang Amma said, “The relationship between man, Nature and God—Sanatana Dharma is the culture that saw this relationship in its entirety. 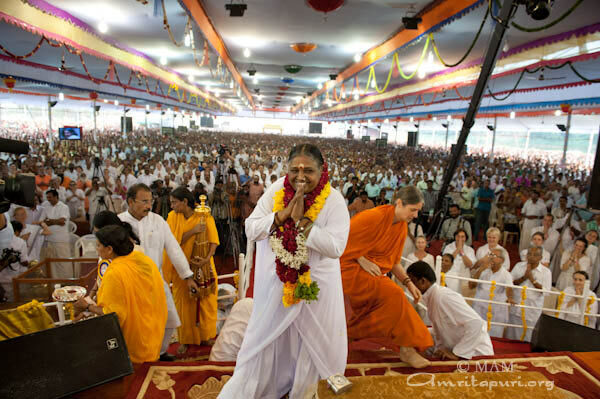 Hindu Dharma offers the world principles and ideals of goodness and betterment for all beings. 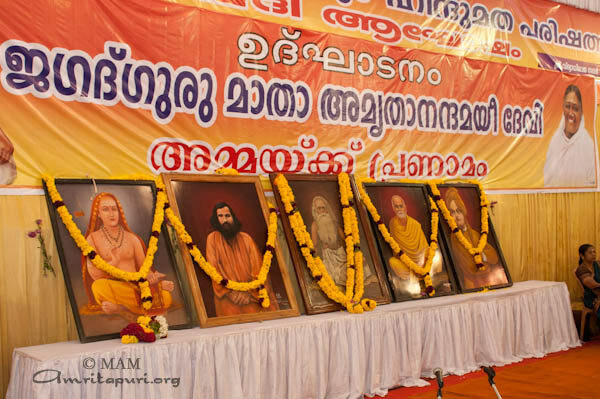 These have been handed down to us through the generations as the experiences of our rishis. Sanatana Dharma, in reality, is not a religion. 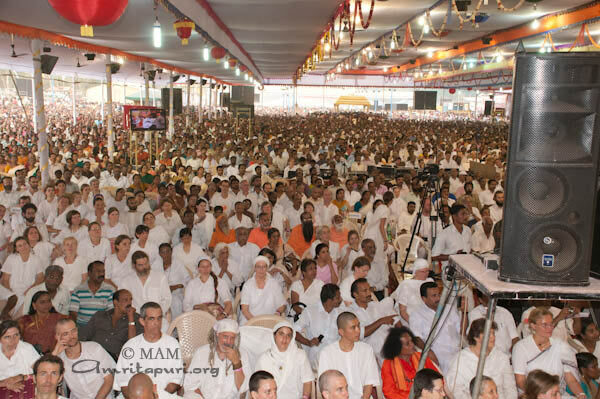 It is the sum total of all the principles, pathways of spiritual practice and customs leading to the moral and spiritual upliftment of everyone. Dharma, artha and kama—all are accepted. 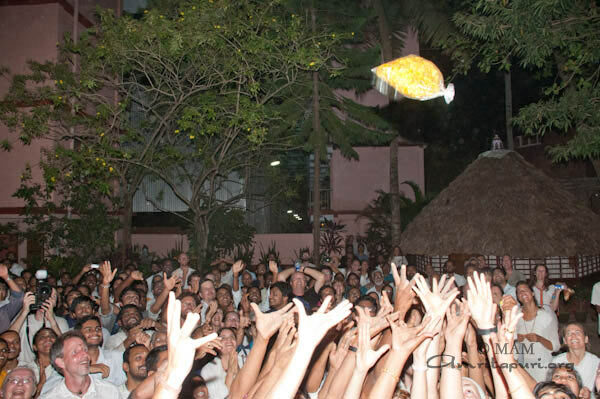 However we are also reminded that moksha—or Self-knowledge—is the real goal of life. 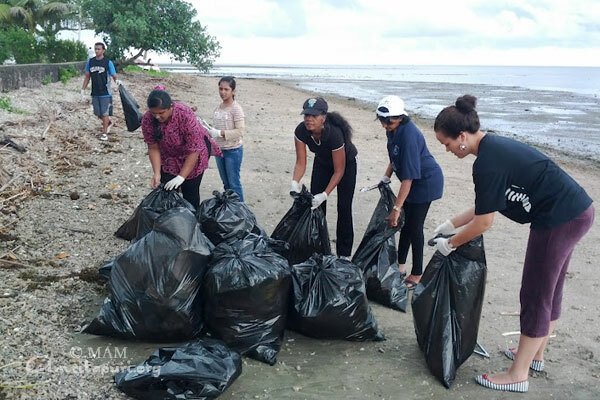 Hindu Dharma’s foundation is the expansive vision of seeing and worshipping out True Self in all beings, in the earth, the sky, the wind, the ocean and the whole of nature. 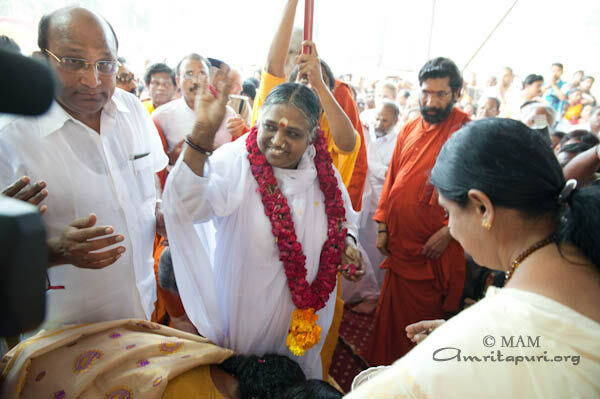 After the bhajans Amma led everyone in a manasa puja and mediation before starting darshan. 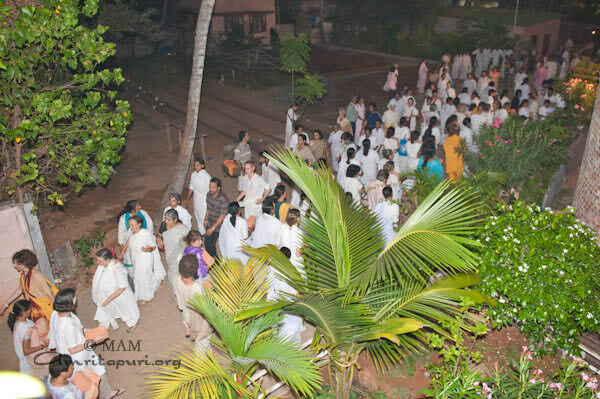 At the time of posting this, (3am on 6th Feb), Amma is still continuing darshan on the banks of the sacred river Pampa at Cherukolpuzha.